AUSTRALIAN ‘conservative’ environment Minister Melissa Price is in “No Doubt” that Victoria’s recent bush fires were caused by mankind’s 1 extra carbon dioxide molecule in every 10,000, or an increase of one thousandth of one percent of CO2 over a 150 year period. AUSTRALIA’S contribution to global plant food and fire-retardant CO2 = 1.3% of all that! As Victorians in the state’s east survey the damage done to their properties by bushfires, the Environment Minister said Australians across the nation had suffered from the nation’s hottest summer on record. “There’s no doubt that there’s many people who have suffered over this summer. We talk about the Victorian bushfires; (in) my home state of Western Australia we’ve also got fires there,” she told Sky News this morning. Coalition figures, including former prime minister Malcolm Turnbull, have been reluctant in the past to link climate change to recent natural disasters such as bushfires. Residents of a small rural community heaviest hit by Victoria’s weekend bushfires believe dan­g­er­ously high fuel loads on vacant­ crown land contributed to the feroci­ty of a blaze that left Country Fire Authority firefighters unable to defend some properties. The quiet hamlet of Tonimbuk, about 90km east of Melbourne, felt the brunt of the fire crisis, with seven properties destroyed and 11,000ha burnt by a lightning-strike blaze that raced out of the Bunyip State Forest. Andrew Clarke, the owner of the Jinks Creek Winery destroyed by the Bunyip fire, believes a bureaucrati­c blunder cost him his life’s work. He said a planned burn-off in 60ha between his vineyard and the state park was not done because of concerns for local birdlife. “If they’d been doing the burning off they should have been doing, our place might still be there,’’ he told The Australian. Mark Knight with his sons Jack & Elliott, in Tonimbuk, managed to save their property after a bushfire engulfed the Bunyip state forest in Victoria. Picture: Stuart McEvoy. Melissa Price, the new federal Environment Minister, has done untold political damage to a government already divided over climate action by spouting idiotic green propaganda about Victoria’s bushfires. On Tuesday, she linked the fires to climate change, claiming there is “no doubt” of its impact on Australia. Sorry, minister, it wasn’t climate change that caused the latest bushfires which have so far destroyed nine homes in Victoria, and it wasn’t climate change that killed almost 200 people in the Black Saturday fires ten years ago. The real culprit is green ideology which opposes the necessary hazard reduction of fuel loads in national parks and which prevents landholders from clearing vegetation around their homes. The ongoing poor management of national parks and state forests in Victoria and green obstruction of fire mitigation strategies has led to dangerously high fuel loads over the past decade. That means that when fires do inevitably break out they are so intense that they are devilishly difficult for firefighters to contain. As a federal parliamentary inquiry heard in 2003, if you quadruple the ground fuel, you get a 13-fold increase in the heat generated by a fire. Locals know the truth. Andrew Clarke, owner of Jinks Creek Winery, which has been destroyed by a fire which raged out of the Bunyip State Forest, “begged” for fuel reduction burns to protect his property. “I’ve been begging them [Forest Fire Management Victoria] for 20 years to burn off the state forest at the back of our place and still to this day it hasn’t happened,” he told the ABC’s Country Hour. Clarke said a planned burn-off was called off because of concerns about nesting birds. So how did that work out for the birds? Just three weeks ago, Victoria’s former chief fire officer Ewan Waller warned that state forest fuel loads were reaching deadly, Black Saturday levels. No one paid any attention. But you can bet Premier Daniel Andrews will hide behind the climate change furphy. Parroting green lies suits politicians because then they can avoid blame for their own culpability. MORE FROM MIRANDA DEVINE: Who’s afraid of the big bad climate monster? The Black Saturday Bushfire Royal Commission criticised the Victorian government for its failure to reduce fuel loads in state forests. It recommended more than doubling the amount of hazard reduction burns. Instead, in the last three years, alone, the Andrews government has slashed the amount of public land being hazard reduced by almost two thirds. The wonder is that the Morrison government is helping him with his alibi. The extreme heat buckled one of the rail-lines between Box Hill and Surrey Hills, delaying Melbourne trains for 30 minutes. MELBOURNE, Jan 13. – Nearly 40 bushfires were reported throughout Victoria today when the temperature in Melbourne rose to 105deg [41°C]. So hot was the sand at West St. Kilda yesterday that life-savers, in a march past, broke formation for the first time in the history of Victorian life-saving clubs and had to resume the march along the water’s edge. The secretary of the Royal Life Saving Society of Victoria (Mr. Pier dell) described yesterday as one of the worst he had known on Victorian beaches. AUSTRALIAN politicians push a never-ending barrage of fact-free global warming climate change alarmism, fear and propaganda on the taxpayer in order to stoke fear and justify the spending of billions upon billions of their hard-earned money on fake fixes to a fake scam. HOW many more billions of taxpayers hard-earned money will be spent on the greatest pseudoscientific scam ever perpetrated against mankind before our politicians learn how to google “TROVE“? Basic climate history, documenting events no different to today that completely trashes their costly, fake, political, man-made climate change scam costing the country and the planet an estimated $2,000,000,000,000 US (2 Trillion) per year, every year! POLITICIAN’S punishing industry and jobs with punitive and draconian climate policy, including billions spent on useless windmills and solar panels with ZERO criticism or investigation of years of reckless ‘Green’ environmental policy mandated by UN-infected local councils who, under the draconian program of Agenda 21 aka ICLEI, prevent the clearing of any foliage, trees or grasses above 8 inches on residents own private properties! ENOUGH is enough. People’s livelihoods, their communities and economies are being ‘burned’ alive by gutless and superstitious politicians on a costly and dangerous crusade of “Save The Planet” hubris driven by politics, ideology and groupthink, pseudoscientific climate change dogma. THE Black Thursday bushfires were a devastating series of fires that swept through Victoria on February 6, 1851. They are considered the largest Australian bushfires in a populous region in recorded history, with approximately 5 million hectares, or a quarter of Victoria, being burnt. Twelve lives were lost, along with one million sheep and thousands of cattle. THE year preceding the fires was exceptionally hot and dry and this trend continued into the summer of 1851. On Black Thursday, a northerly wind set in early and the temperature in Melbourne was reported to have peaked at 47.2 degrees C (117 degrees F) at 11:00am. “The temperature became torrid, and on the morning of the 6th of February 1851, the air which blew down from the north resembled the breath of a furnace. A fierce wind arose, gathering strength and velocity from hour to hour, until about noon it blew with the violence of a tornado. By some inexplicable means it wrapped the whole country in a sheet of flame — fierce, awful, and irresistible.” (Wikipedia). IN 1851, carbon dioxide levels were around 285 ppm. Today, carbon dioxide “pollution” levels are around 400 ppm. CLIMATE change alarmists, like Tim Flannery ,their ABC, and The Greens claim Australian bush fires are unprecedented and becoming more extreme, thanks to human carbon dioxide “pollution” emissions. THEY tell you this because the ultimate prize of the Climate Crisis Industry is the control of carbon dioxide (energy). Virtually every human activity, including breathing, releases carbon dioxide. Consequently, greenhouse gases have become weaponised in the global effort to control every aspect of your life and lifestyle. On February 6, 1851 – Melbourne was 117°F at 8AM. Data like this wrecks the global warming story, so BOM simply makes them disappear. 17 Jan 1857 – BLACK THURSDAY. ASSOCIATE editor at The Australian and Sky news presenter Chris Kenny hits back with logic and reason to the lazy correlation by Leftist media and celebrities who associate every weather event and bushfire to man’s emissions, in an effort to improve ones virtue and morality over the next. The inanity of a) pretending we haven’t always faced horrendous fire conditions b) pretending Australian action can change the climate while global emissions growth dwarfs anything we do. IN the era of Global Warming Climate Change hysteria, every and any “extreme weather” or climatic event is instantly blamed on humans and their wicked ways. RUSHING to ideological and schizophrenic judgement is at best lazy. At worst, such deliberate grandstanding prevents salient solutions to real environmental problems and climate mitigation challenges we face everyday as a society. THIS fashionable and dangerous eco-paradigm no more obvious than in the tragic California fires, still smouldering. MENTION “land management” as a solution to prevent future wildfire catastrophes, and the climate mafia will viciously deride one a “denier”, “flat-earther”, “right wing nut job”, “shill of the oil industry” or maybe a “racist” if you’re still hanging around. ANY name will do, as long as the pejorative is sufficient enough to prevent the conversation shifting away from “CLIMATE CHANGE!”. SO, while California burned and the Climate Ambulance Chasers blamed, more measured minds were assessing causes of the fires with data and reasoning instead of defaulting to emotions, politics and groupthink ideology. Paul Homewood is one who thinks rather than blames. His research helping to quell the superstition and paranoia endlessly levelled by global warming zealots whenever catastrophe strikes. HOMEWOOD’s latest post begins with a typical Paul Driessen fact-packed and, as usual, beautifully written masterpiece “Blaming climate – ignoring incompetence – CFACT“. CFACT are of course dead right. There is really very little point in blaming weather/climate when you can do nothing about it anyway. It is government’s job to tackle the problems they can do something about. But as for claims about climate change, is there actually anything to them? Let’s take a look at temperatures for a start. As we can see, the hottest summers were in 1908 and 1917. Summers now are much cooler than the period prior to 1940. Anybody who uses tries to blame California’s wildfires on “extreme weather” is not only flying in the face of the facts, but also failing to deal with the real causes. NEWS FLASH! Climate change and drought would thin out forests. Jerry Brown admits that the forests are overly dense. How do you get overly dense forests in a drought? Climate change didn’t cause all the tightly packed homes to be built in the forests. LET’s study the data and the facts before we yell “GLOBAL WARMING” at every pass. We will achieve a lot more for a fraction of the political, social and environmental cost! WAY too much common sense and logic for the climate ambulance chaser brigade! Paradise California gets plenty of rain, and has moderate temperatures. News Flash, climate change and drought would THIN OUT FORESTS. Jerry Brown admits that the forests are overly dense. How do you get overly dense forests in a drought? Climate change didn’t cause all the tightly packed homes to be built in the forests. These laws, and others like them, have drastically reduced the amount of forest thinning and controlled burns that used to effectively keep wildland from becoming a danger to people and property. “One problem for landowners is disposing of deadwood. Dozens of biomass facilities that burn tree parts that can’t be used for lumber have closed due to emissions regulations and competition from subsidized renewables and cheap natural gas,” wrote The Wall Street Journal. Another year, another set of deadly fires burning up California. The devastation is heartbreaking. The “Camp Fire” has almost completely obliterated the Northern California town of Paradise. It’s now officially the deadliest fire in California history. Over 40 people have died. This horrific blaze, along with the Woolsey and Hill fires in Southern California, have inflicted untold property damage, laid waste to towns and huge swaths of wildland, and taken dozens of lives. These wildfires are becoming an annual occurrence in the Golden State. Are these calamities just the “new normal,” as California Gov. Jerry Brown recently said? They don’t have to be. President Donald Trump took to Twitter to blast poor land management as a cause of the continual fires. 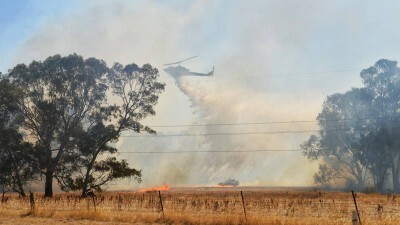 Not only do wind turbines act as the perfect bushfire-starters, their presence precludes the best and safest method of fire-fighting from controlling them: aerial water bombers won’t fly within cooee of these things – experienced pilots have declared that they won’t fly within 3km of a wind turbine, even without the country around them on fire. For a rundown on pilots’ attitudes to flying anywhere near wind farms – see our posts here and here and here. Starting on Saint Patrick’s Day, 17 March, Western Victoria was set ablaze, with thousands of acres of farming and grazing country razed, sheds and homes destroyed and savage livestock losses. Here’s an account given by residents who witnessed what happened at AGL’s Macarthur wind farm. AND STILL THE TURBINES KEPT TURNING!